Virtual Reality (VR) has revolutionised the manner in which humans visualise, adapt and interact with simulated environments and its applications within the field of healthcare has extended from student medical training to pseudo surgical collaborations. Medicine can be envisaged as a balance of trade-offs, where the benefits associated with implementing this pioneering technology to drive improvements in patient welfare are offset by the risks of physical desensitisation, patient data privacy and the excessive costs. Is it ethically acceptable to employ standard VR practices throughout the NHS that is intrinsically grounded upon providing the great of good and welfare to patients, with the avoidance of misapplication and ill health? 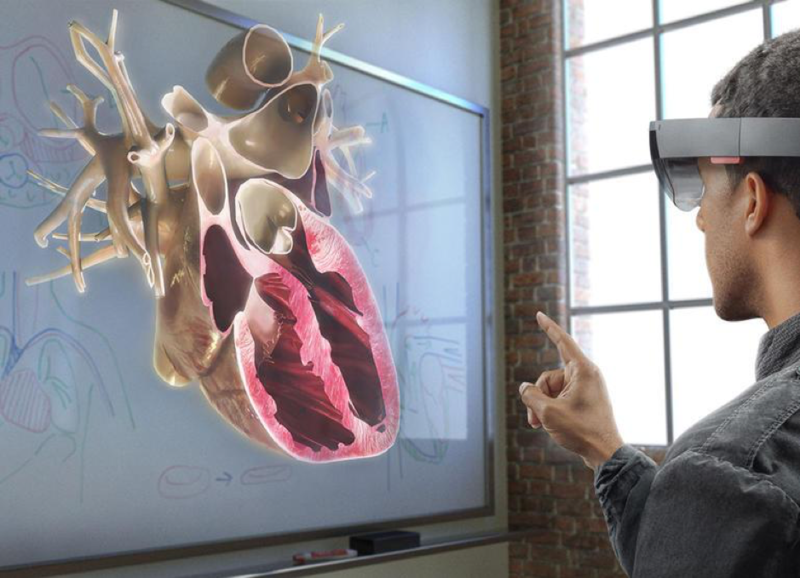 Current VR technology is generating benefits that could transform the way medical professionals and patients experience healthcare. The use of Microsoft HaloLens is advancing the field of VR by overlaying CT scans of the patient over their body. Surgeons can “see” patient’s unique anatomy and can navigate away from important structures when making incisions. In other areas, an emerging technique at Alder Hey Children’s Hospital incorporates CT and MRI scans, creating a virtual image of an infant’s heart in which doctors can explore, enabling a more accurate diagnosis of the problem prior to surgery. This will reduce the need for exploratory surgeries, in aim of increasing the diagnosis success rate and reducing the need for subsequent corrective operations. The foremost practicality behind employing simulated operations is the availability for the surgeons to train within safe and controlled environments at no harm to the ‘patient’ or surgeon, improving dormant and acquiring new transferable skills, whilst building confidence due to the repetitive nature. The advantage of a systematic training platform such as ‘OssoVR’ ensures all doctors can perform independently, as the lack of training in current graduates means that 30% of junior doctors cannot perform individually. In addition, this universal platform regulates medical training to the same standard at an accelerated educational progression. The ability to record and map surgical procedures from multiple standpoints into a platform allows students to envisage all roles within the operating team, without posing risks from being present. 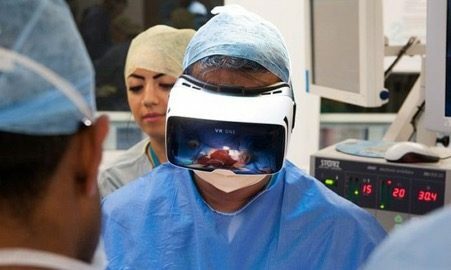 The emerging use of VR can bring together surgeons from around the world to operate on patients, as proven when surgeons from Mumbai and London simultaneously wore headsets appearing live in the same operating theatre at The Royal London Hospital; each pointing to 3D scans appearing as holograms and engaging in discussion. The use of VR in this manner is arguably democratising surgical practices, as it does not limit insight only to those present in theatre. Of more importance to global development, its use in this sense could be used to improve accessibility and equality in healthcare globally. Based on the theory of Utilitarianism, when various methods of treatment are available, the patients’ welfare and wellbeing should be paramount as actions should always be taken to consequently result in ‘the highest quality of happiness’ and it is morally eudemonistic to consider the welfarism of all. Utilising this technology should not be limited as it produces the greatest good for the greatest number, with the avoidance of misapplication. Kant’s theory argues that moral decisions should be made based upon universal principles. If the action in question here is allowing VR to be used in surgical procedures and enhancing medial training, this action ultimately improves patient welfare and may result in better global equality. It would be hard to argue against improving standards of living and improving healthcare globally as being morally correct, therefore it is our moral duty to allow VR to be introduced into relevant surgical procedures. Based of virtue ethics, it can be argued that the use of VR in medical/surgical procedures is unethical. The modern theologian James F Keenan suggests that an important virtue is justice and that ‘justice requires us all to treat human beings equally and impartially’. The problem with VR is that ‘technical difficulties mean some physical findings such as skin colour cannot be taught in simulators’. This may lead to the unequal availability of treatment for different patients. For example, someone with white skin may have access to state-of-the-art VR technology treatments whereas people of other races would have no choice but to be treated by traditional methods. The increasing use of VR in the assistance of the practice of assisting medical students is increasing the likelihood of defective learning. As the systems are manufactured, the programme could miss out vital signs in the simulation. This could lead to students potentially neglecting potential life-threatening signs of an illness/disease within the body. Also, the use of VR may encourage shortcuts when dealing with an ill patient. Based on the theory of care ethics, doctors/surgeons should understand the importance of building a relationship with the patient. However, with the use of VR, the development of understanding how to build a patient-medic relationship may be omitted; instead VR may encourage the development of an artificial relationship rather than one that is genuine. Defective learning may also encourage shortcuts, such an omitting patient consent and abiding by safety procedures. The practicality of using VR must also be addressed; a common reason for using VR within surgery is for real-time broadcasting, allowing the global medical community to observe. However, most operations can take anywhere up to 18 hours each time, so battery life of VR systems becomes very problematic; Google Glass’s battery life is limited to around 30 minutes when videoing and Microsoft HoLolens has a battery life of just 2.5 hours. The additional pressure of changing a VR system mid-operation could become very problematic and potentially life threatening. Introducing VR into hospitals and operations will require the implementation of specialised consent forms and new laws and regulations. These forms with new patients that had yet received treatment and with the addition of VR, this would take a substantial amount of time ensuring that the patients understand how the technology is utilised. Introducing VR will eventually lead to lengthy ethical discussions with a multitude of people including: physicians, developers and patients. As described in the preceding article, it can be argued ethically that the benefits of improving surgical training and success rates outweigh the reasons against VR implementation of defective learning and manufacturing flaws. This topic is contentious and targets the traditionalist outlook, however our verdict lies upon the Utilitarianism theory which ensures the great of good to a large number of people. We therefore ask for your opinion, should VR be employed throughout NHS surgical and medical procedures? An interesting topic. While I can see the benefits, it seems like the worries about technical difficulties and the breakdown of the personal relationships between healthcare professionals and patients is an ethically important issue. Therefore I think there are serious concerns in its use in procedures. Interesting article. I think using VR to train surgeons who are new to the field could be extremely useful, however it is important to note that it will never perfectly replicate reality which could be a shock to some when they perform real operations and possibly have an adverse affect on quality. Also it is important to realise the high monetary cost associated with VR. With the constantly reducing NHS budget, would this be diverting funds from other areas of the service? This could cause an ethical dilemma if so. Problems stated about the uses of VR seem to be mainly centred on technological issues, ethical issues such as VR not being as effective on patients who aren’t white skinned, or not fully reproducing a “real life” surgery go away with improvements to the technology. I would therefore suggest using those arguments as justification to not use VR in surgeries and surgery training are actually counterproductive since it is only by adopting and improving the technology that the issues can be addressed. Really interesting article. There are definitely some advantages to implementing this technology. I’d suggest that Utilitarianism isn’t the best ethical theory to follow because in the attempt to achieve the greatest good for the greatest number there is potential to lose the personal connection between Surgeons and patients due to an impersonal process. Also, Utilitarianism ignores the rights/ needs of minorities and it could lead to unethical decisions being made in order to satisfy the masses. VR is taking us forward in construction, from allowing clients to walk through their buildings before they are built to practicing intricate construction techniques. Sounds like the medical profession has similar opportunities and I think the NHS should grasp them. Yes there are risks – there are risks with everything – but they can be managed and on the whole we will benefit. From the introduction, I wasn’t clear on the benefits of using VR in surgery. However, these benefits were made clear in the next section. I wasn’t fully convinced of the ethical reasoning against using VR – something to develop in assignment two. A topic that has such relevance to so many industries in the current climate. Whilst I can see many benefits to the application of this technology, something I wish could have been pursued for some of my recent hospital visits, the disadvantages to the patient are significant and the emotional connection can be lost. In addition, the breakdown of VR could lead to potentially fatal applications of the headset and large law implications could be pursued by the victim if there are difficulties in the operation, a strong ethical foothold. This is a really exciting prospect for medicine! It’s amazing that we are finding new uses for technology every day that will increase quality of life for so many people. I would argue that human life should be protected at almost any cost, but with the increasing pressure on the NHS budget for example, would the benefit of these new technologies be worth the cost of installing such high-tech new equipment? Is the the benefit widespread enough to justify the investment? Could it lead to potential cutbacks in other areas, potentially more generalised departments, or potentially lead to higher costs to patients to help subsidise? I hope not because it sounds really great! I regrettably find myself concurring with ‘RJN’ above. Technology only improves with increased usage, ‘ironing out the kinks’ so to speak. While the ‘ethics problem’ is intertwined with advances in medicine – and in this case, medical technology, I believe it lacks sufficient weight here; surgeons aren’t entering the matrix, and we’re not altering genetics to create the perfect human. At most, using VR in surgery is supplementary. VR is set to inevitably create a completely new future in engineering and many frames of industry for our youth, with the integration of AI. Despite the significant impact such technology could create, the treatment of patients who may have life-threatening illnesses would be potentially favoured for the ‘improved’ surgical environments, probably providing inequality to patients who could benefit from such technology too and may miss out if VR is not laid out across the whole industry. In addition, the problem of patient mistreatment due to the software interface may lead to loss of emotion and connection between surgeons and patients. Really good read with lots of interesting points! I think that in the everlasting search for medical improvement it is a must to develop this technology. If VR can help to improve just one person’s life then it is has been worthwhile. In the current crisis that the NHS faces with understaffing, VR offers an opportunity to cut teaching costs and give junior doctors and students access to technical training that is just not possible in the current climate. There's No Space For It!